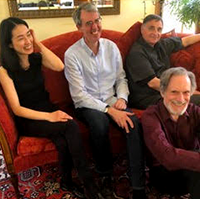 Bend the Knotted Oak, the chamber music group,will present “Music From Revolutionary Russia.” The quartet is led by pianist Uel Wade and features Mitsuko Suzuki (violin: Albany Symphony), Ronald Carbone (viola: St. Luke’s Orchestra; principal: American Ballet Theater), and Robert Reed (cello: Detroit Symphony; CUNY Assoc. Professor). A BKO musical evening has been described as including “the smell, the taste, the culture out of which the works of art have come.” This side of the experience is supplied informally, and often with humor, by Wade’s pre-music commentary. The works on this program were composed by people who survived the turbulent pre- and post- revolutionary period in Russia when certain compositional styles were denounced by Stalin–and even banned. Therefore, though the musical vocabulary will be familiar, much of the repertoire will be new to a modern audience. Among the composers are Khachaturian,Taneyev, Tcherepnin, and a woman, Varvara Gaigerova. This concert is made possible in part with public funds from the Community Arts Grants/Decentralization Program of the NY State Council on the Arts, administered in Columbia County by the Greene Co. Council on the Arts.